Dr. Stephen Robertson is the director of the Roy Rosenzweig Center for History and New Media at George Mason University. 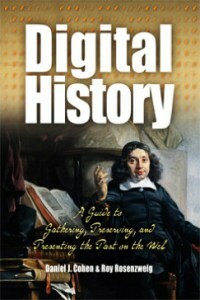 For the last nine months I’ve spent much of my time exploring digital history. Part of becoming director of RRCHNM involved familiarizing myself with areas of work about which I had only passing knowledge despite almost twenty years of reading, teaching and creating digital history. Moreover, preparing for the Center’s pending 20th anniversary required looking back at more than 100 projects created in two decades of work. It was against this backdrop that I read the most recent outbreak of debate about digital humanities provoked by the special issue of differences, “In the Shadow of the Digital Humanities” (vol.25, no. 1, 2014), and Adam Kirsch’s article in the May 2014 issue of The New Republic, “Technology is Taking Over English Departments: The False Promise of Digital Humanities.” From that perspective, what is striking is the almost complete absences of digital history in those accounts.Matthew Kirschenbaum and others do make room for it by emphasizing the plurality of digital humanities and Lisa Rhody brings the key digital history text – Dan Cohen and Roy Rosenzweig’s Digital History – into the conversation – but ‘dh’ here is clearly standing in for digital literary studies. calling our work “digital humanities” has made it more difficult for us to make it understandable and creditable in disciplinary context: the unified interdisciplinary message may be useful with funding agencies or the Dean of Arts and Sciences, but it may be less so with one’s departmental colleagues. At RRCHNM, our mission is to use “digital media and technology to preserve and present history online, transform scholarship across the humanities, and advance historical education and understanding.” This focus has seen the Center create open access resources for K-12 & university teachers, build exhibits with library, archives and museums, collect born digital records, crowdsource transcription, and build open source software. As Tom Scheinfeldt has pointed out, these practices do not originate in humanities computing, the dominant origin story for digital humanities, but in oral history, folklore studies, radical history and public history. I’m not saying that the presentation of material online is not part of digital literary studies: electronic scholarly editions and manuscript collections such as The Shelley-Godwin Archive are longstanding parts of that field, but, as the current debate indicates, at present they are not its predominant focus.